It’s been said that dogs are “man’s best friend” and this list only proves that to be further true. 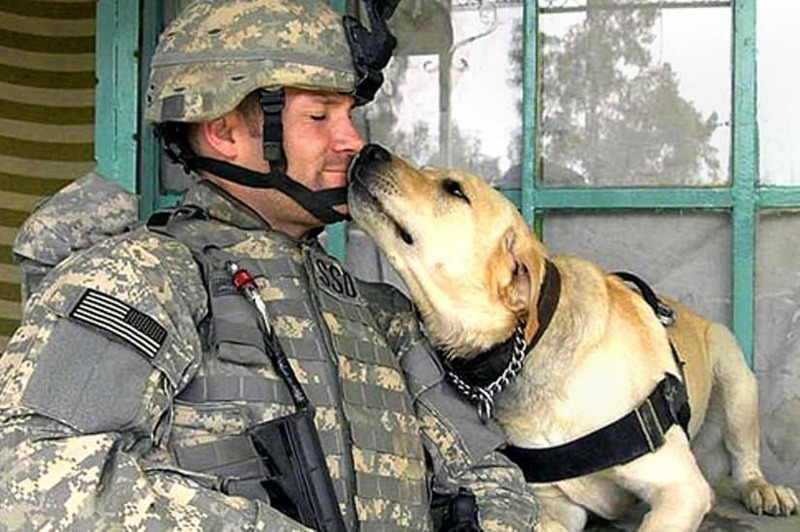 Studies have shown that pets, specifically dogs, can cause a soothing sensation to anyone, and can be particularly helpful to soldiers or veterans struggling with Post Traumatic Stress Disorder (PTSD). The pets can draw out withdrawn personalities, and having to praise the animals has been shown to help traumatized veterans get over emotional numbness. Teaching the dogs service commands develops a patient’s ability to communicate, to be assertive but not aggressive, a distinction that a lot of soldiers and veterans struggle with. These heartwarming photos of soldiers from different sides of different wars with various animals prove that there is good and kindness everywhere, even in the roughest people in the world. The belief in the healing power of a dog’s tongue dates back to ancient Egypt and has continued throughout history. In modern France, they have a saying that translates to “A dog’s tongue is a doctor’s tongue.” Not to mention the smile it put on this soldier’s face. 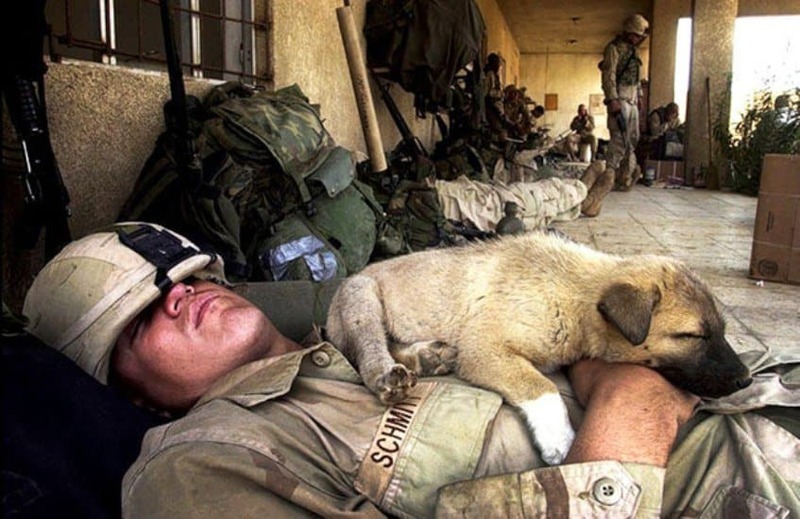 This tired soldier and his puppy decide to take a quick nap together. Notice how the puppy lays across his chest; whether or not it’s intentional, he’s protecting the soldiers heart. 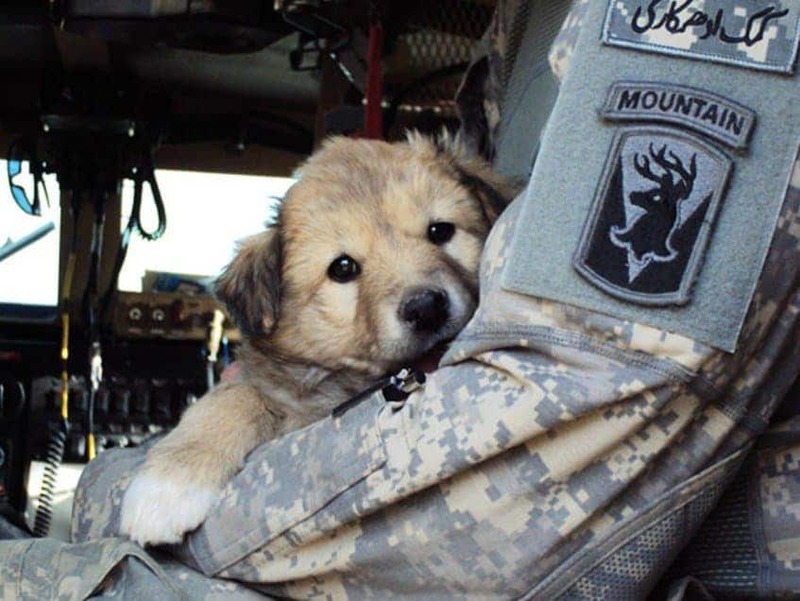 This is a puppy adopted by soldiers overseas. Although we don’t know where they are from, it must have been really hot, because apparently this little pup hid anywhere he could to escape the heat. 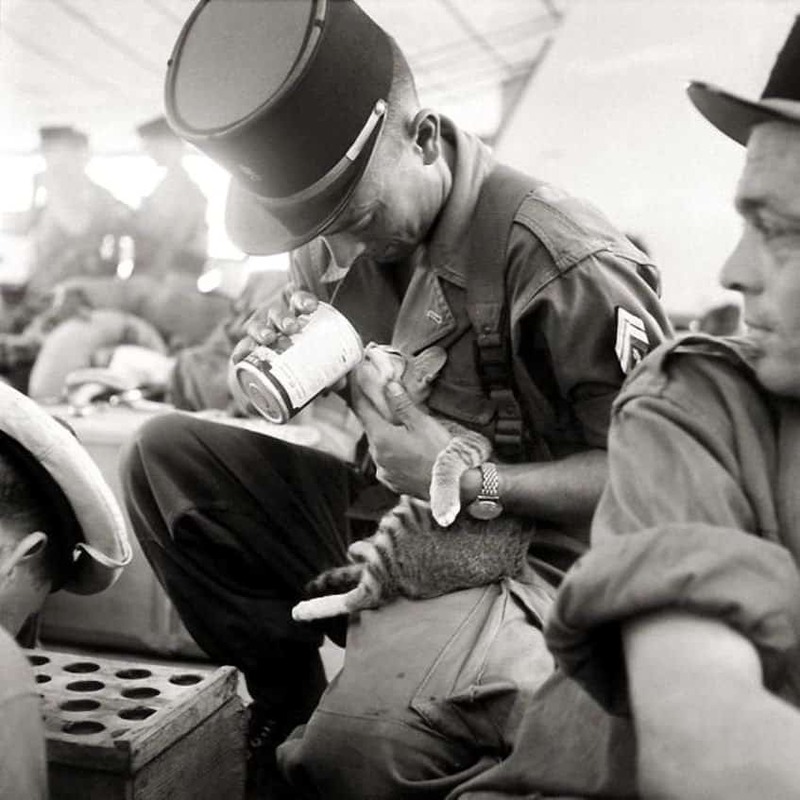 This French soldier is feeding a young kitten during the Vietnam war. He adopted this kitten himself and we’re sure built lots of memories with it. You can clearly see the absolute heartbreak in this dog’s eyes. The things they most likely went through together, the good and the bad, this death was one that the dog could not save his soldier from. 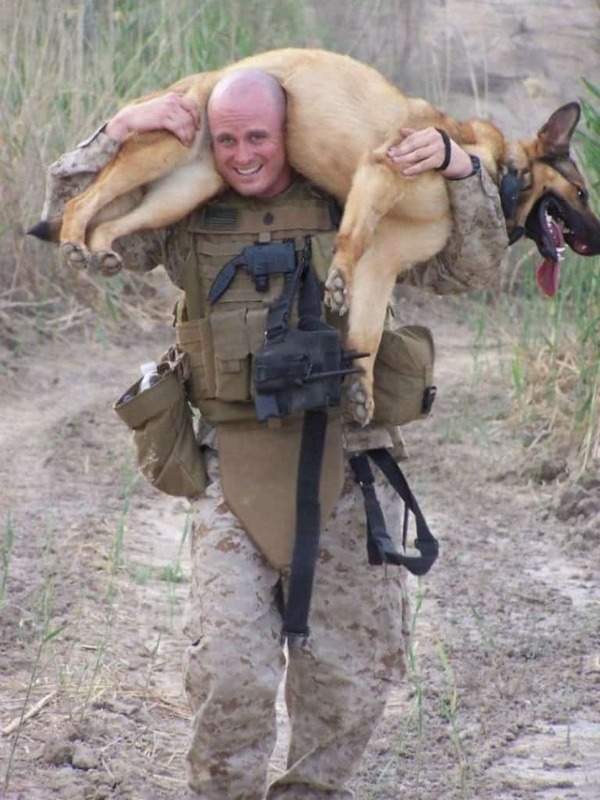 This marine gives his dog a lift back from an extremely tiring two-hour search mission. “We’re in this together” applies to the dogs as well. 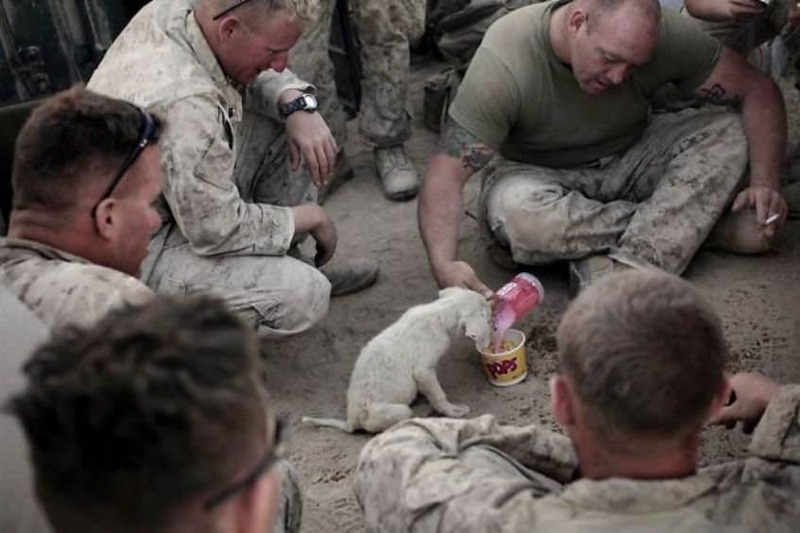 This is a beautiful photo, because to see a group of not only completely grown men, but highly trained Marines fawning over a stray puppy, is absolutely adorable. In this picture, we see the Marines sharing their breakfast with a stray dog. 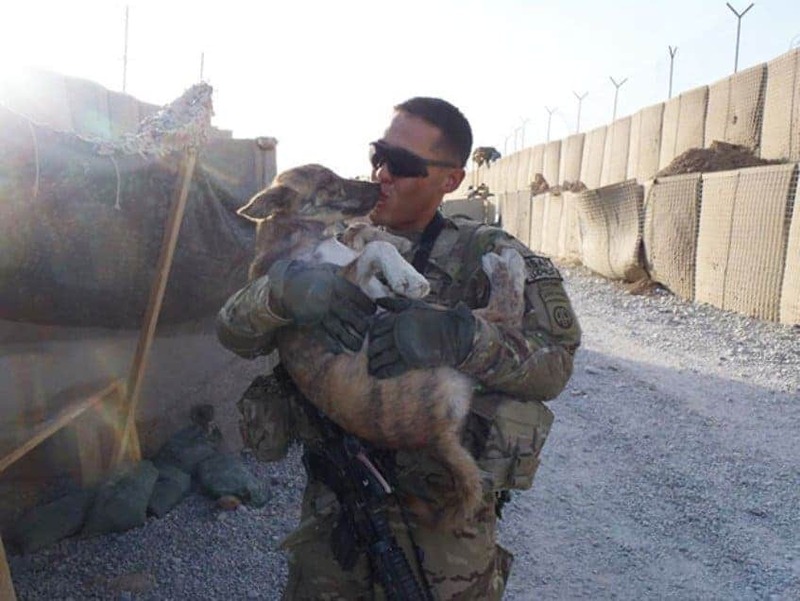 This soldier and his friend rescued this dog in Afghanistan and clearly they hit it off as well. A lot of dog rescues in foreign countries result in life long friendships. Dogs aren’t the only animals that provide comfort for soldiers overseas. This kitten has taken up residence in the knapsack of this soldier. 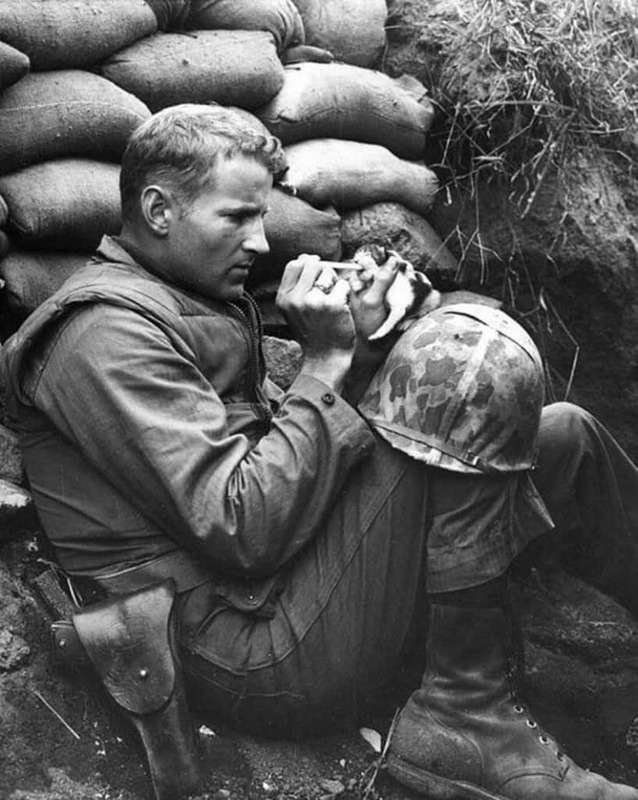 This is Marine Sargeant Frank Praytor, and the little guy in his hand is an orphaned kitten. 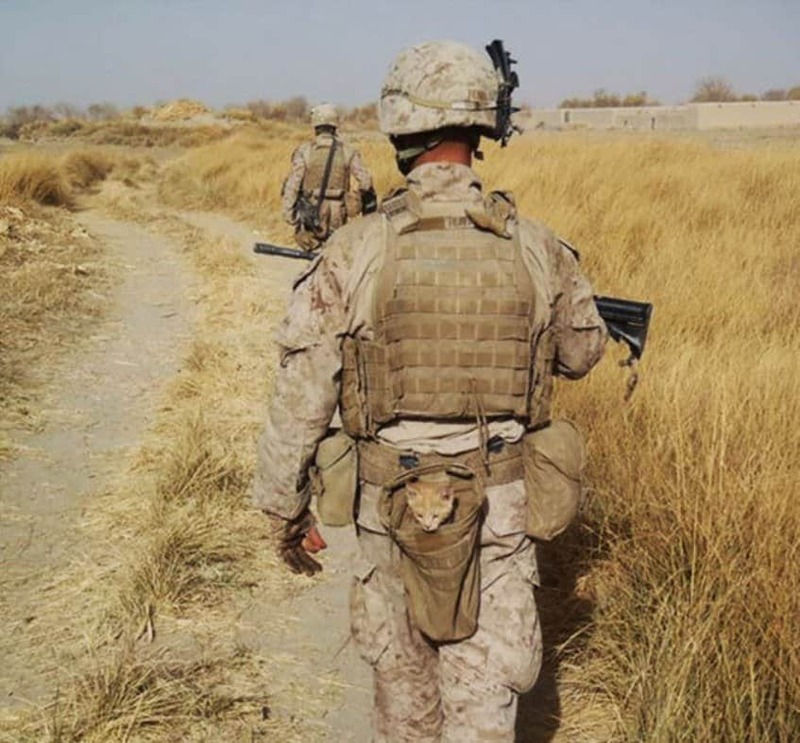 Sargeant Praytor adopted this kitten after its mother died from the war. The compassion that he showed to this baby kitten was reciprocated, with cuddles and purrs. 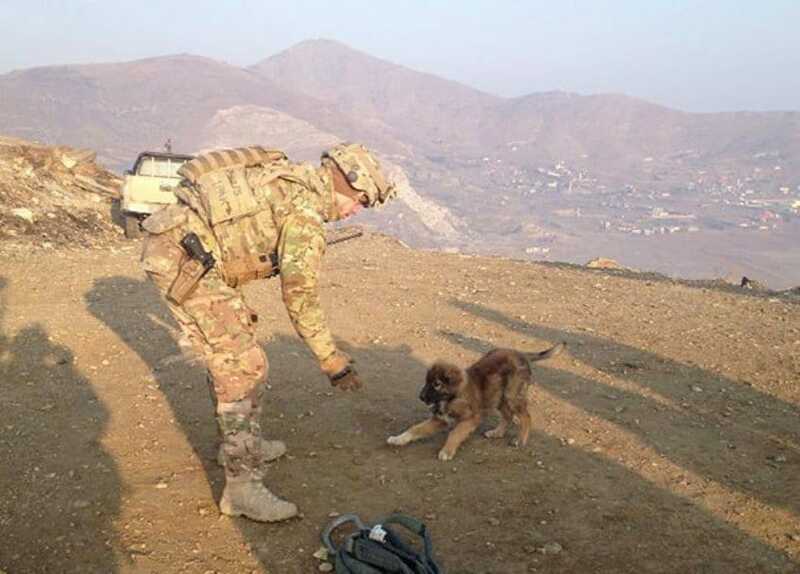 This soldier rescued this puppy from a war zone. A lot of dogs are rescued this way and then put up for adoption on the Puppy Rescue Mission website. This goes to show how wonderful these soldiers are; not only do they serve and protect our country, but also animals across the world! 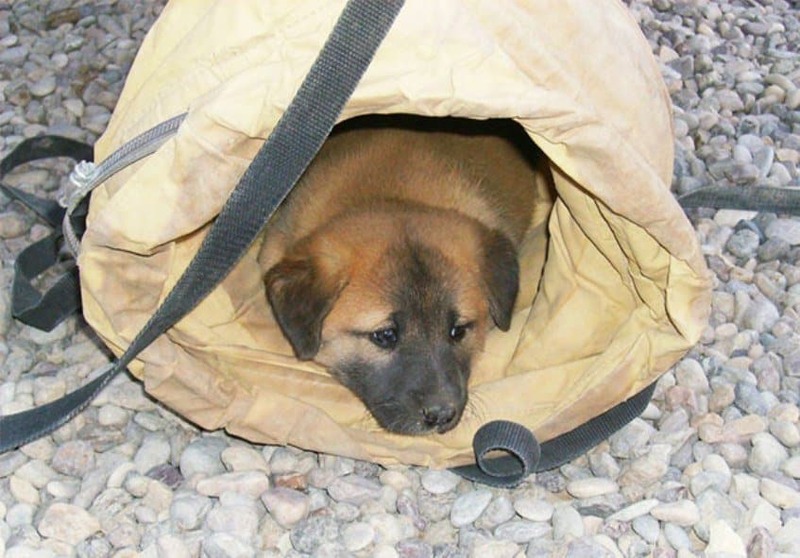 This little guy is just one of many puppies that grow up to become military dogs – they serve by rescuing, delivering, searching and detecting mines or bombs, and oftentimes they serve as companions to soldiers as well. 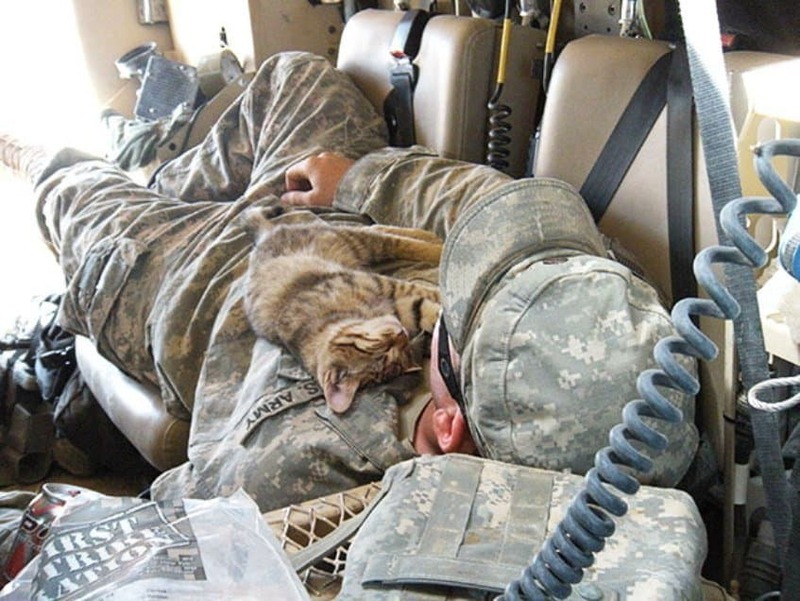 A fellow soldier took this photo in Afghanistan in 2009 of an American soldier taking a snooze with a stray kitten. Photos like this one are just a reminder that even the toughest of men can’t resist a nap with a baby cat. 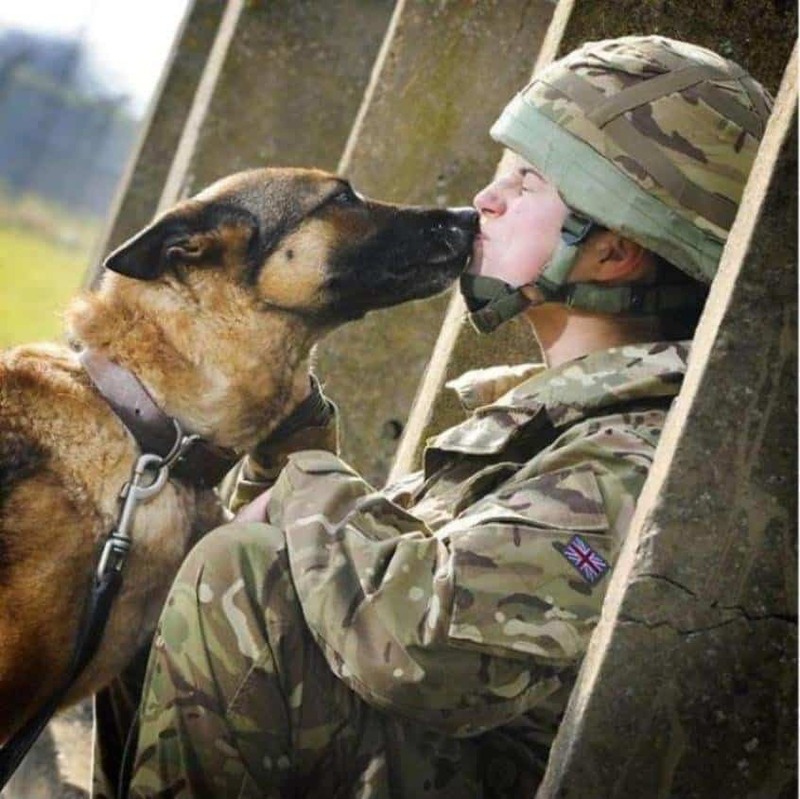 To be honest, we’re not too sure if this photo is of stray dogs, or trained military dogs, but it is still a beautiful portrayal of the love that a dog has for its master. 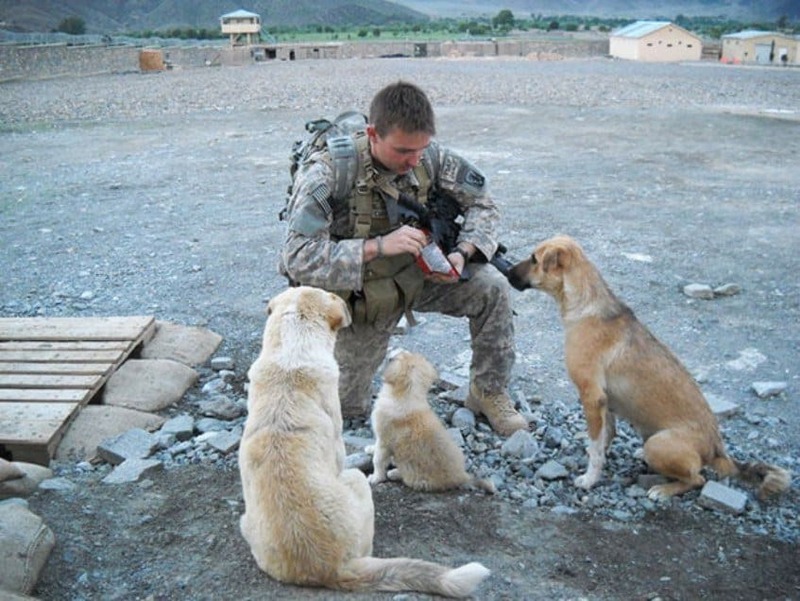 This kind soldier was feeding these three dogs, or should we say, his three best buds. 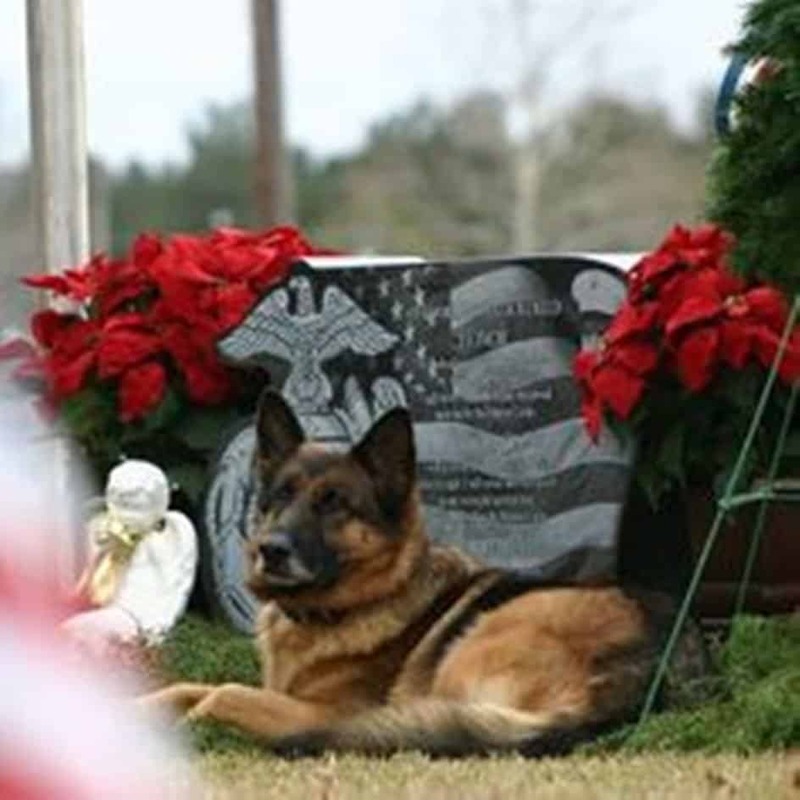 This soldier’s dog loves him more than life itself, and that’s evident in this beautiful picture. You can see the absolute adoration in his eyes, and you can tell the soldier doesn’t mind the love either. 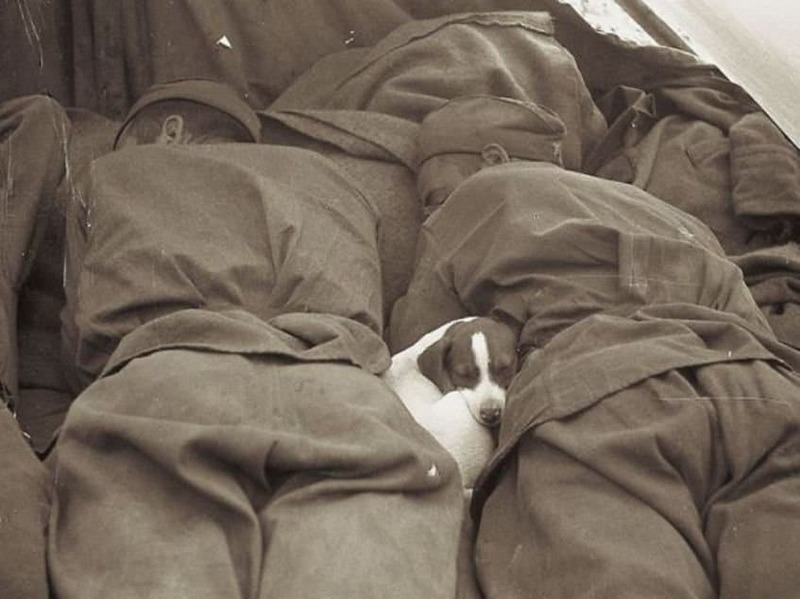 These are Russian soldiers from World War 2, sleeping with a small puppy in between them. What a beautiful testament to the kindness extended from all areas of the world. 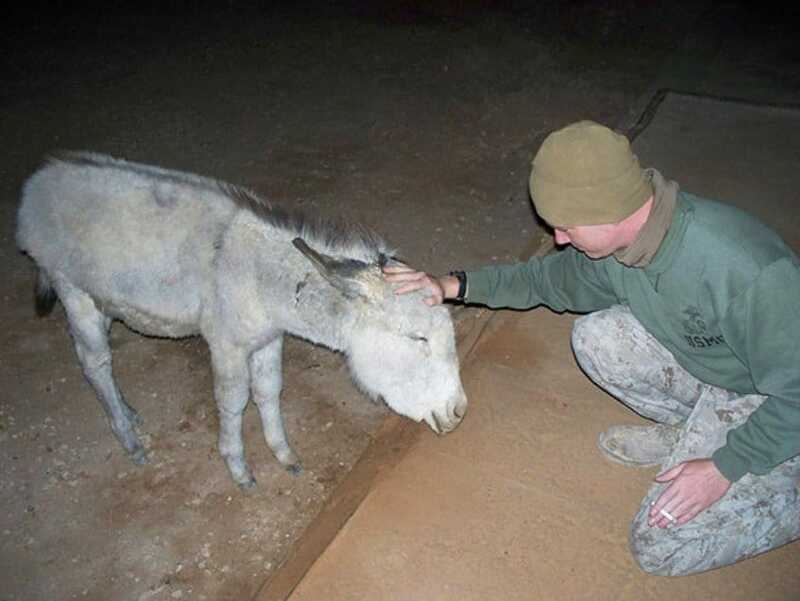 These soldiers in Iraq adopted a pet donkey! A very unlikely pet, but apparently donkeys are considered very intelligent and loyal animals. Just look at how happy he is to have his head scratched! 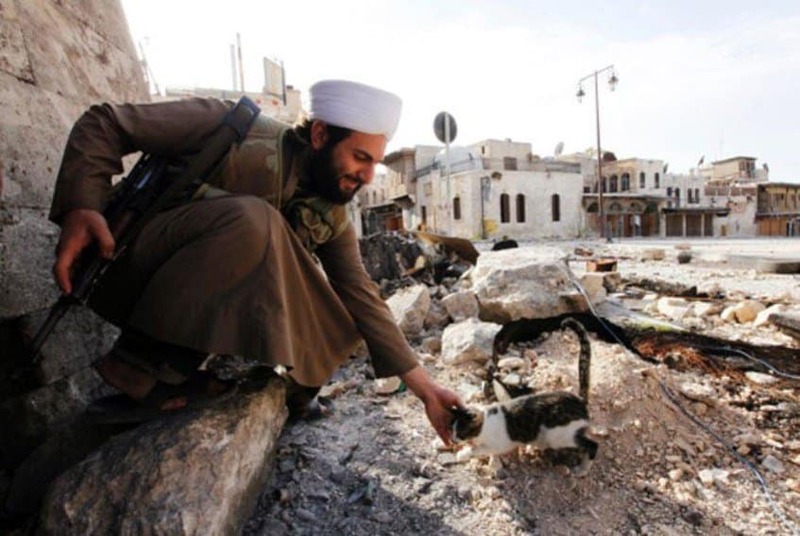 A soldier takes a moment of compassion and gentleness to scratch this kitten behind the ear. 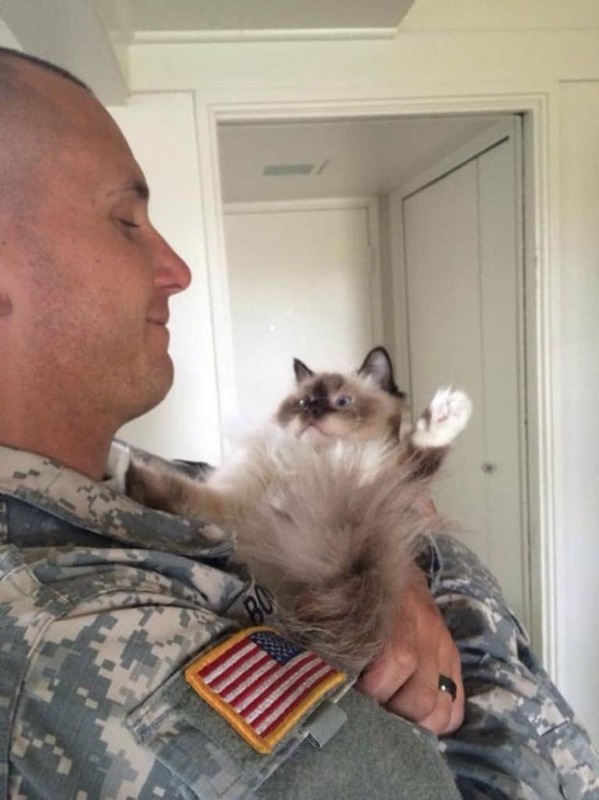 This soldier comes home to his kitten who is both surprised and excited to see him. The happiness in both of their faces is enough to put a smile on ours, and hopefully yours. In Kabul, Afghanistan, a group of soldiers had to stay atop a mountain. This stray puppy joined them and kept them company for a little while. 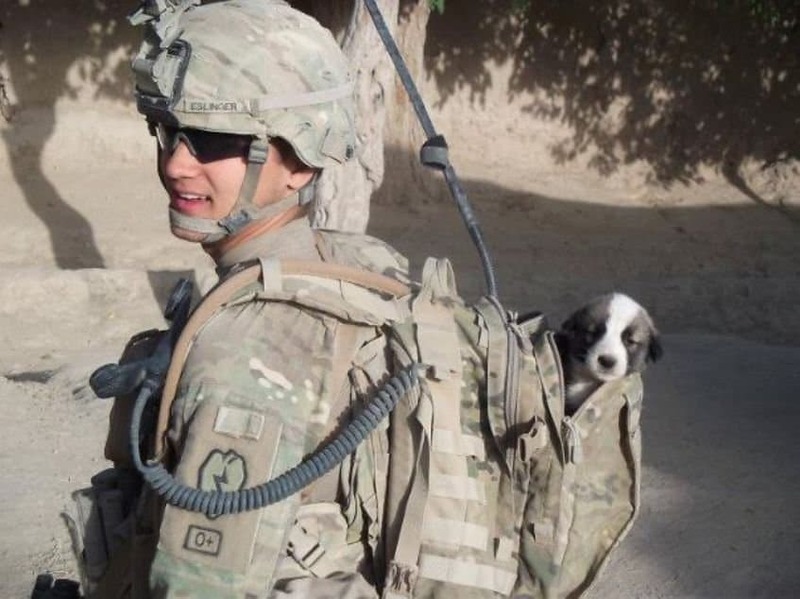 We’re sure it brought enjoyment to both the soldier’s and the puppy.